It’s fall on the farm and the 2nd annual Community Harvest Festival is brewing at Growing Gardens – Boulder’s favorite urban garden located in the heart of the city, easily accessible by the local bike path. The festival provides kids and adults of all ages and interests a chance to enjoy a myriad of nature, art and leisurely activities. This free celebration is open to the public for celebrants to enjoy pumpkin painting, face painting, a crazy bubble-making machine and dressing up like a farmer or beekeeper. The pumpkin patch is loaded with pumpkins to buy and not to be missed are the Growing Gardens awards for Community Gardeners—awards for best tomatoes, best garden leader, best weeding and more. Oskar Blues’ CHUburger Bonewagon, a biergarten sponsored by The Post Brewing Company and lively bluegrass music in the garden guarantees a fun and lively event. The Community Harvest Festival is Wednesday, October 1st from 4 p.m. until 7:30 p.m. at Growing Gardens beautiful 11-acre organic garden located at 1630 Hawthorn Ave in Boulder. Note the rain date is Wednesday, October 8th. Check online for updates at GrowingGardens.org. 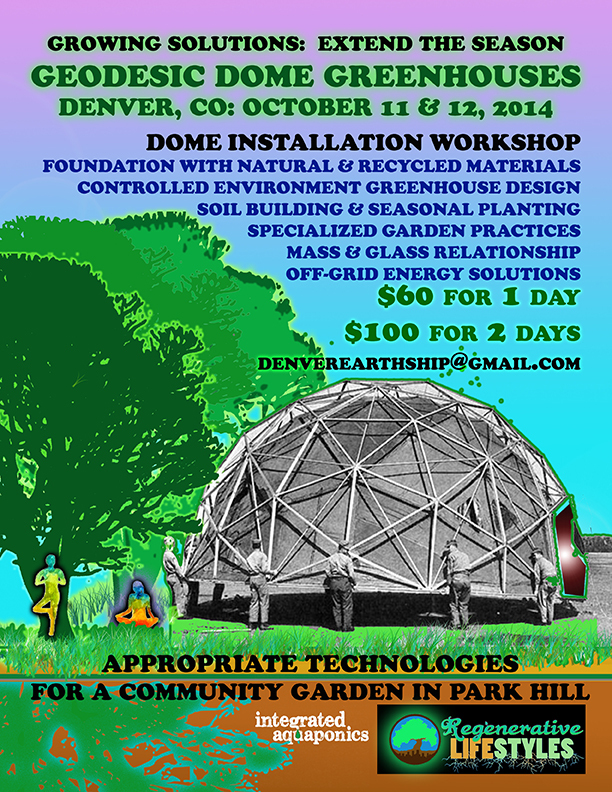 In this weekend workshop we will be building a 22 foot Geodesic Dome Greenhouse as a way to explore Appropriate Technologies for extending the growing season in at an urban community site. 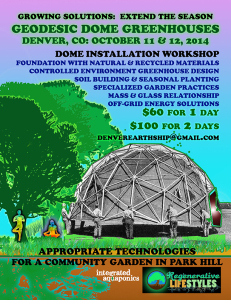 Join us to learn, help enhance the productive community garden in Denver, and bring these skills home to your own neighborhood! This wonderful review of NAPC was contributed to The Boulder Beet by Sandy Cruz of High Altitude Permaculture. One major milestone at NAPC was an impromptu dinner attended by most of the PINA board, people from the Permaculture Institute of North America (PIUSA), and representation from Gaia University — three organizations working with a permaculture diploma process. Although I missed the dinner, I hear that there was much agreement and potential collaboration among all three groups, greatly to the benefit of all permaculturists in North America. Edges which many of us have ignored were openly challenged at this convergence. There was a session on women in permaculture, race and privilege were discussed in various contexts, disability issues were recognized, economic inequality loomed large, and age differences elicited a strong response, as some youth felt left out of the conversation. The morning circle on Sunday and the closing circle that afternoon addressed these concerns to some extent, and several people committed to keep working on them — to broaden the permaculture movement, and to encourage more diversity and discussion at the next convergence, We can’t just leave it to these folks, though — to build a truly viable, broadscale movement, healing issues of rank is something for all of us to contemplate, to include in our designs for invisible structures, and to implement. Bio: Sandy Cruz founded High Altitude Permaculture in 1992 and has established a 2-acre permaculture research and demonstration site in Salida, Colorado. She serves on the founding board of the Permaculture Institute of North America (PINA), has trained about 65 permaculture teachers across the US, and consults on site planning and design. Sandy also leads the Dances of Universal Peace and has a song for just about any occasion.